Super Hero Boy: Who said fairies are just for girls? Who said fairies are just for girls? We went to a Halloween event at our local zoo last night. Connor saw lots of monsters, one of which had four heads on a chain and two bloody knives and unlike most of the kids that were screaming in horror, Connor insisted on giving him a high five.. only my kid! We rode the monster train and for the most part Connor was pretty brave even laughing at a few parts. The highly of his night though was another little girl in line that was dressed in the cutest Tinker Bell outfit ever. He squealed and kept saying over and over "Tinker Bell is here!!". 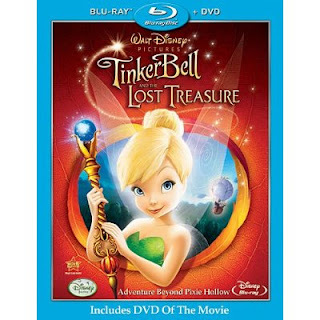 What people may not know about my precious little boy is, one of his favorite dvds of all time is the newest Tinker Bell adventure : Tinker Bell and The Lost Treasure that just came out on blu-ray/dvd combo. Why can't he love Tinker Bell after all she's always been my favorite with that little attitude of hers and her tomboyish charm. Plus I can't help to admire a fairy who is as disaster prone as I am, though her keen whit and pure determination always gets her through. He asks to watch it at bedtime quite often and you know Tinker Bell is one of my favorite Disney characters too so I'm always happy to oblige him. Tinker Bell and the Lost Treasure does not disappoint. I mean did you check out the clip with the trolls? Hilarious! Tinker Bell has got herself into a fix this time though after breaking the magical scepter who turns out is incredibly hard to replace she is stuck attempting to find a way to replace it! Not without a little help from her new firefly friend Blaze though! Again Disney has me jumping for joy for a blu-ray release that comes with a standard dvd as well. I'm telling you these things are brilliant as though we have a blu-ray player in the living room quite often Connor wants to watch his favorites in the car or before bedtime in his room and I'll be perfectly honest with you guys there is no way on earth I can afford to outfit our entire house with blu-ray players at the moment. Though personally I don't think there is any other way to properly watch a movie, much less a Disney movie! These two packs though solve all my problems and wow does Tinker Bell look amazing on blu-ray! I'm always concerned on the quality with the direct to dvd movies but both Tinker Bell movies out thus far really have wowed us with their quality! Even the soundtrack is pretty amazing. We've only had the movie a short time and Connor has already watched it at least a dozen times if that gives you any idea. There are some cool extras including a little personal tour of Pixie Hollow and some really awesome deleted scenes including more scenes with the new beloved Blaze and my personal favorite the trolls! If you have a Tink fan in the house you really must pick up your own copy of Tinker Bell and the Lost Treasure right now on Amazon! Regardless if you have a blu-ray player or not I highly recommend you buy the blu-ray combo pack as you WILL at some point and this pack has both copies in it for very little extra!